Fast return on investment – our automatic cutters pay for themselves in as little as one month! 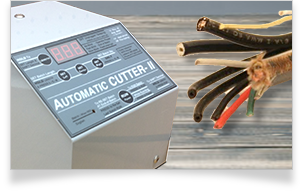 Our automatic cutters are batch-cutters for wire, coax cable, and tubing all wrapped up in one efficient, automatic, programmable unit at an affordable price. Our automatic cutters perform a wide range of applications for different materials and sizes. Take a look at our specifications for more detailed information. With our automatic cutters, your employees can do other tasks, be more efficient, perform less repetitive work, and get jobs done faster and safer. Both the Automatic Cutter II and Automatic Cutter III pull directly from your free turning spools, with no pre-feeder needed, and the knife for each can be resharpened. When changing from one material to another, just program the length and quantity you need, press ‘run’ and watch it do the work! It will stop if there is a problem or when the batch is done. It’s simple and efficient. That allows you to concentrate on other things. 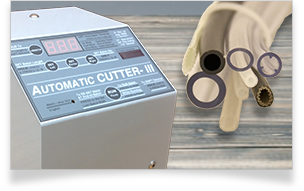 The Automatic Cutter II & III are priced at just $1,995 per unit. For those special needs such as cutting magnetic-wire or other unique materials, ask about our rubber rollers. This option prevents marking of or damage to your materials that can sometimes happen with steel knurled rollers. 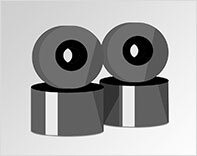 The optional rubber rollers for our cutters are just an additional $200 per unit at time of purchase of the cutter. And, if you ever need service on your automatic cutter, just contact us. We service our cutters at our factory within 24 hours so your downtime is minimized.